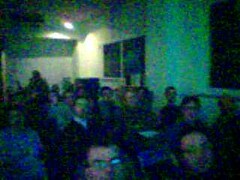 Yesterday we were hosted by the wonderful people at the Milan Java User Group: the seminar room at the Mac shop was really crowded and I was pleased to see a couple of known faces among the public. Our slides (available online) on the strategy, user experience and technical aspects on Mobup raised a lot of interest (we mobupped some photos while speaking), it’s always cool speaking to smart programmers who make smart questions and suggestion. We’ve also been so lucky to be invited in another couple of Italian Java events (one of those is really HUGE), more on this in the time coming. This entry was posted in Beef and tagged 2.0, application, conference, mobup, personal, work by admin. Bookmark the permalink.